An update, finally. I’ve been busy starting a new job. This is a split pentomino placement puzzle, as seen in this year’s puzzle GP, a candidate puzzle for the GP finals which were held today during the WPC in London. 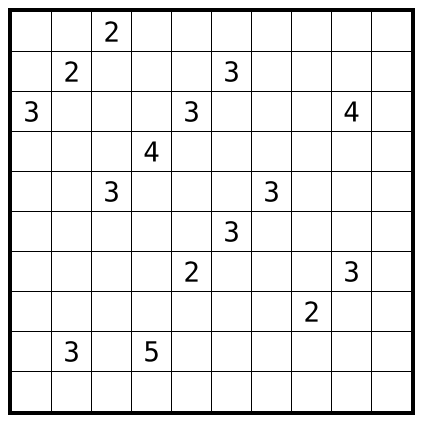 Rules Place a full set of pentominos across both grids, such that they don’t touch, not even diagonally. Clues count the number of cells that are part of pentominos in the corresponding row or column. This entry was posted in Puzzles and tagged hard, pentominos, split pentominos, variant on 2014-08-14 by rob.